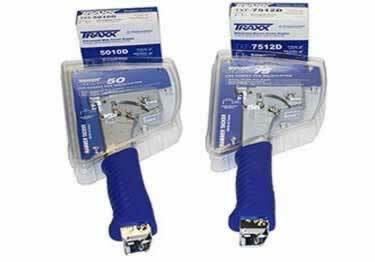 Heavy-duty TRAXX PadPro Hammer Tackers are the choice in hammer tackers for professional carpet installers. Designed with an ergonomic handle for increased installer comfort. They feature quick bottom-loading of staples for on the job efficiency. KSC is offering two models of hammer tackers, the PadPro 50 and the PadPro75, both great for carpet pad installation. Superior stretch in carpet installation. Available in light-duty residential through heavy-duty commercial applications. High quality Carpet Seaming Tapes & Carpet Welding & Seaming Iron are ideal for today''s softer, temperature-sensitive carpets. Built to last. Crain flooring tools are designed for the flooring professional who demands top performance at the jobsite. Knee Pads provide a comfortable, durable knee protection solution to allow users to get down to business in most any application.